These refreshing, fruity margaritas have been my drink of choice lately. I highly recommend them. 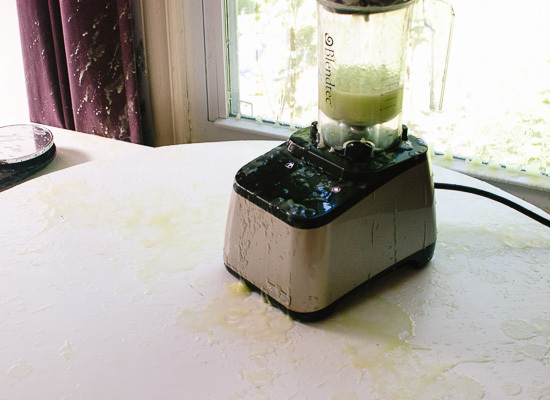 A word of warning, though—do not overfill your blender with melon. I learned that the hard way today. Honeydew melon went everywhere! Honeydew on the window. Honeydew on the rug. Honeydew on my camera. Honeydew on the walls. Honeydew on the dog. Honeydew in my hair. Does anyone know how to clean honeydew juice off velvet curtains? Serious question. I think I’ll ponder the matter over a honeydew margarita. Cold, refreshing, fruit-sweetened margaritas. 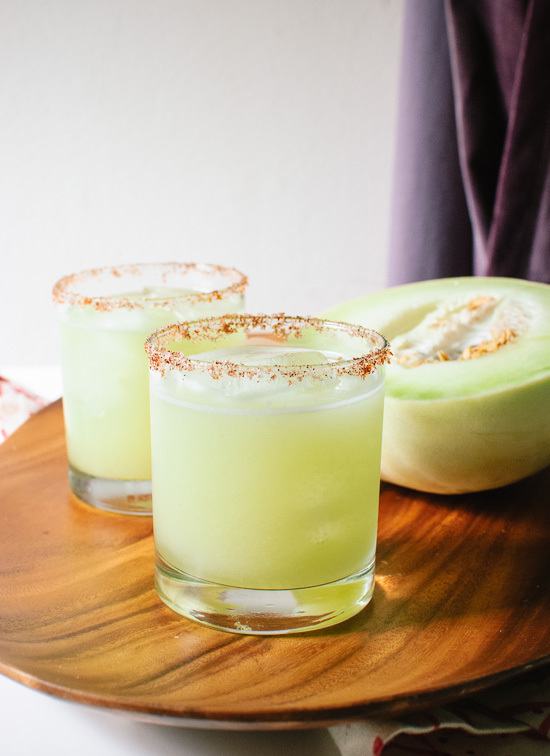 These summer cocktails are really easy to make with fresh honeydew melon, lime juice and tequila! To make the honeydew juice: Use a chef’s knife to slice the melon in half. Use a big spoon to scoop out the seeds, then discard them. Use the spoon to scoop pieces of melon into the blender. Put on the lid of your blender and blend until there are no remaining bits of melon. Do not overfill your blender! Work in batches if necessary. 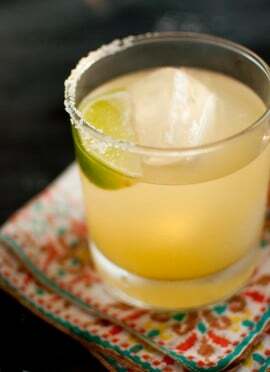 Prepare your margarita glasses: On a small, rimmed plate, mix together the salt and chili powder. Run a wedge of lime around the top of each glass. Dip the top of the glass into the salt blend at a 45-degree angle and roll it from side to side to catch the salt. Add ice cubes to your glass and set it aside. To make margaritas (feel free to make multiple margaritas at once): Fill a cocktail shaker with ice. Pour in the honeydew juice, tequila and lime juice. Put on the lid and shake for 30 seconds. Taste and add sweetener if desired (mine didn’t need any). Strain the liquid into your prepared glass(es). Cheers! Change it up: Not feeling tequila? This drink is also fantastic with white rum. Recommended tequila brands: Espolón or Milagro. Recommended equipment: Love my Blendtec blender, which I received from the company a few years ago. 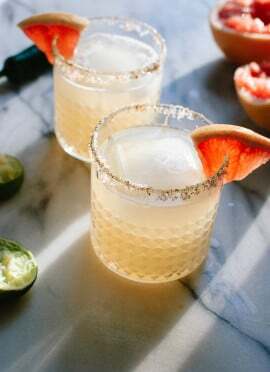 If you love this recipe: You’ll also love my classic agave-sweetened lime margaritas, pear nectar with reposado tequila, cantaloupe fiesta cocktails and serrano-spiced paloma cocktails. These look delicious. Love the color. And oh my that mess. I’m so sorry Kate. Ack. The photos of Cookie’s tongue are pretty priceless though! 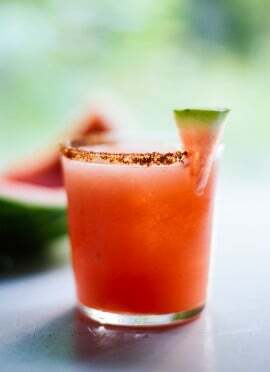 It’s 100 degrees outside and these look so cool and refreshing – love the salted rim! 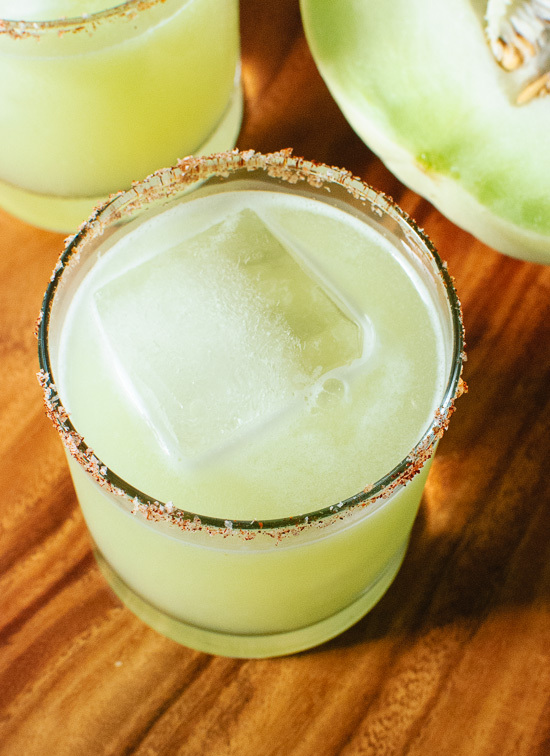 Love the idea of honeydew margaritas! Love even more the fact that you showed us pictures of the mess and Cookie helping to clean it up!! Oh no! I did a similar trick when I tried to puree spinach once. The ivory coloured cupboard doors still carry a greenish tinge :-) Good thing you have Cookie around to help with the clean up. These look wonderfully refreshing. . ….will try them out when summer finally hits oz. This looks incredibly refreshing, and totally worth the mess – which looks similar to a green smoothie incident I had recently. Those green drinks man, they’re sassy. Those green drinks will turn on you in a split second! Gotta watch out! These look great plus they sound super yummy as well! Amazing idea! Love the color and the simplicity of this drink. You’re my cocktail goddess, Kate! P.S. Honeydew juice on curtains…ooops! True life of a food blogger, huh? 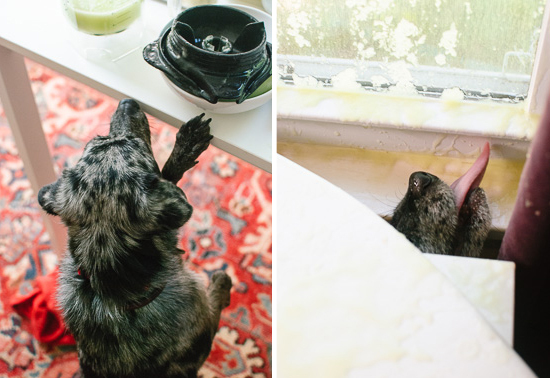 Oh my goodness your puppy didn’t mind the blender explosion! So adorable. This looks so refreshing!! These look so refreshing, Kate! All of your cocktails are so creative. I’m glad Cookie was there to lick up all the melon – good luck with those curtains! Well, I was lazy and used my little blender jar instead of washing the big one. Now I know better!!! This sounds amazing! Looks like it’s right up my alley! Oh well, Cookie makes everything better. :) She would go nuts for cake batter! Sweet potato tacos and honeydew margaritas sound like such a delicious pair. Enjoy! These look amazing! 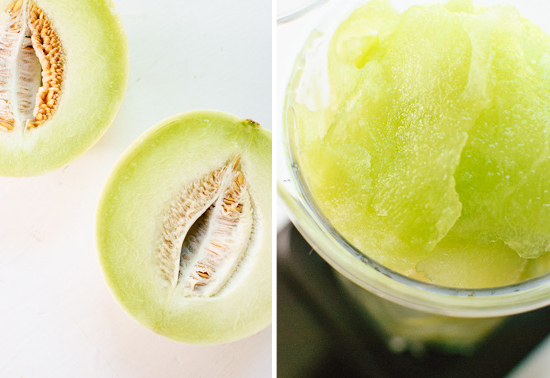 Can’t wait to make them (we love honeydew)! SO sorry the explosion happened to you…and looks like your dog enjoyed it ;). I know you love your Blendtech, but this wouldn’t have happened with a Vitamix, it has clips to secure the lid and prevent it from flying off instead of the tension grip lid :)…just sayin’ ;). Can’t wait to try the margaritas! Aha! Bonus point for the Vitamix. I’ve never used one, but I know they’re great! Looks so refreshing! Wish I knew about this over the summer! Good thing we still have a few warm weeks left. Oops; the link was broken in my previous comment. These just look more delicious the more I look at them! That melon blending sounds like a hairy experience (har har) so I’m glad you had these to sip on at the end of it all. These are so exquisitely beautiful, and with a taste to match, I’m sure. I know what I’ll be making with the next honeydew that comes into my kitchen. Thank you for sharing your beautiful photos and recipe! If it’s good enough for Cookie…it’s worth making these even with an explosion. Other than the overflow, how do you like your Blendtec? I love my Blendtec! I especially love having two jars for it (one wildside and one twister), but I clearly should’ve chosen the larger jar for this task. I haven’t used a Vitamix, so I can’t directly compare the two, but I can say that my twister jar makes suuuper smooth nut butter in under 60 seconds. These sound like such refreshing cocktails! Such a great plan for the last hot days of summer. Ohhh you poor dear! So sorry about the melon explosion. I did something similar once, with lemonade concentrate….. so so sticky, and seriously all over everything, and myself. ahk! Every photo of Cookie makes me smile! Dogs love melon, so my guess is that she’s thoroughly enjoying your mess! I would love to drink this by the pool!!! Thanks, Kasey! Honestly, I’ve never been that into honeydew until a few weeks ago. That’s when I happened across a perfectly ripe honeydew and changed my tune. I think you’d love these! Mezcal! Great idea. Cheers to clinking drinks soon! It sounds like the margarita was tasty enough that it was at least worth the mess! And that has to say SOMETHING, right? Honeydew is actually my favorite melon. Definitely want to try these! Those are beautiful Kate! I love drinks made of fresh fruit. I have blender mishaps all the time :) Really need to learn to not overfill it- and to always make sure the bottom is on tight! Can you use a electric juicer?